Behind the Southern Tackleworks Shop - Southern Tackleworks - Live Bait, Freshwater & Inshore Fishing Southern Tackleworks is Lake County Florida's premier fishing retailer. Located in Tavares, Florida right on the Harris Chain of Lakes, we not only provide the best in rods, reels, live bait, lures, but also fishing advice and repair services. we are MORE THAN JUST your favorite bait & Tackle shop. Southern Tackleworks is not new to the game, we are just changing it. We have over 33 years of Harris Chain catching experience and have been a bait & tackle shop for over 20 years. What started as Allen's Bait & Tackle became Sandy's Bait & Tackle. Once Bill & Sandy were ready for retirement after several great and successful years, John took the reigns and refreshed the store. This included a name better suited for the future- Southern Tackleworks was born. Carrying much of the same inventory as well as tons of new inventory, John and Nick make sure that not only are the shelves stocked full everyday, but that the inventory also includes all the new and exciting products the fishing industry has to offer. You will find all the major brands as well as local brands that crappie fishermen and women prefer. If we don't carry it, you probably won't need it but we will always get it for you within a matter of days, not weeks. Oh and the ice is always free. Yeah, no kidding. Free ice for your cooler, your makeshift AC unit, your catch of the day. If you are a customer, you are family and our ice machine is always crushing. So come by and relax. We would love to give you the hot spots and what is catching everyday. We post the weather and the local tournament news. You will always find a tournament or fishing series on the tv as well. You are family and are welcome anytime. 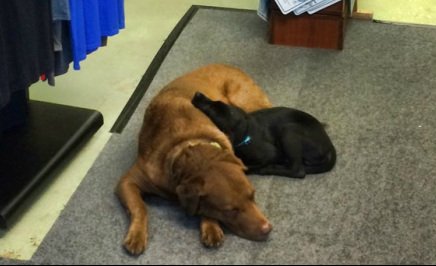 Marley & Finley will be waiting (our shop dog & puppy). Plus, in case you did not know, Tavares is the Sea Plane City so come by and watch the planes take off!